Although statistically there is a 50/50 shot of getting the plug in right the first time it seems like there is a much higher chance of not plugging it in right. This can be very frustrating. 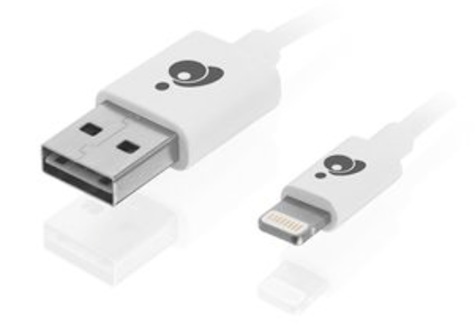 Enter the Charge & Sync Flip 3.3ft (1m) – White, Reversible USB to Lightning Cable from IOGEAR. To the casual observer this cable is almost identical to a standard Lightning cable, until you look at the non-Lightning end of the cable. Where a standard cable has a block on the bottom side of the computer end to hold the cable in place, the IOGEAR Charge & Sync Flip 3.3ft (1m) – White, Reversible USB to Lightning Cable has just a slit of rigid plastic where the top of the block would be, allowing the cable to be plugged into any USB port without the anguish of determining which side should go up. The cable is available in black, blue, pink, white, grey and (for a premium) gold. I love this cable and have been using it for months. The Charge & Sync Flip 3.3ft (1m) – White, Reversible USB to Lightning Cable transmits power very well and has not had any issues with my 3.1-amp charging wall plug. I recommend this cable and give it a 9 out of 10 MyMac rating.